Solvent infused wipe preps surface for flawless touch up repair. Removes surface oil, grease, and wax. 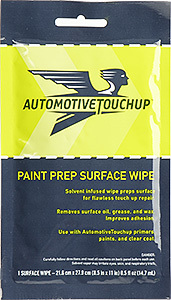 Use with AutomotiveTouchup primers, paints, and clear coat. Paint Prep Surface Wipe by Automotivetouchup. These wipes have been infused with solvent to give you a great result on your touch up repair. Not only do these improve adhesion, but they also remove surface oil, grease, and wax. DANGER: Carfully follow directions and read all cautions on back panel before each use. Solvent vapor may irritate eyes, skin, and respitory tract.